19th Jun 2014, 11:00 AM in Meanwhile! It's been awhile since we saw Fuzzball yelling at Scuzzball. I wanted to get back to basics, but try something new, and it occurred to me that we'd never seen Scuzzball apologize before. So here you are. If you're not sure who these characters are, you could check out the Great Jumping-On Point for New Readers. 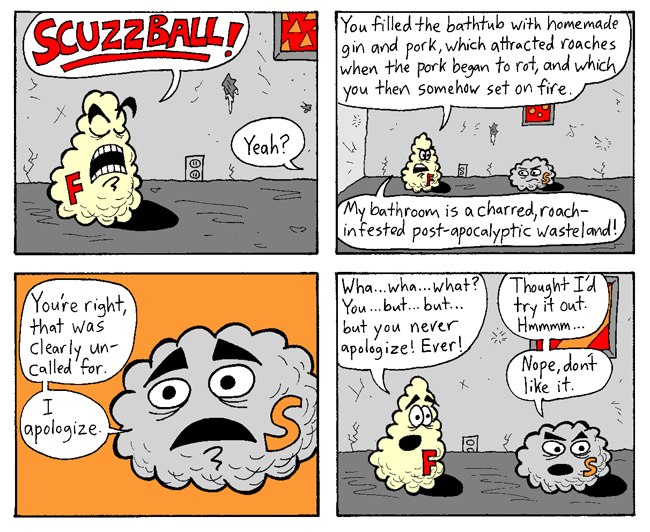 Or you could read this other example of Fuzzball and Scuzzball having a conversation. It's one of my favorites. Next week: Fuzzball talks about cleaning! Weirdo-Freak wears a beret!